We are now 10 days into the holidays and I’m exhausted!! We have had such a busy start to our easter break, I feel like I need a whole day just to sleep and recover. 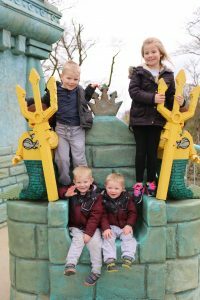 On the Friday we were planning on going to Alton Towers but as we go there all the time and it was such a lovely sunny day, we decided to have a trip down to Chessington World Of Adventures. 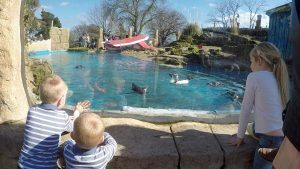 We love it here as it has lots of different rides suitable for all the family and also the animals – which are my favourite. However, it was super busy and we didn’t get to do very much which was a shame [Blog Post Here]. On the Saturday we had a family gathering with Adam’s parents, sister, brother and his partner and children. 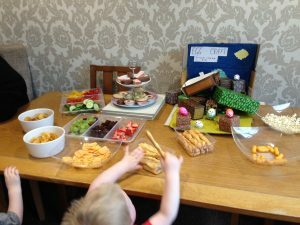 We did a little easter egg hunt and had lots of cakes and picky foods. It was a lovely afternoon and the tiddlies love playing with their cousins. 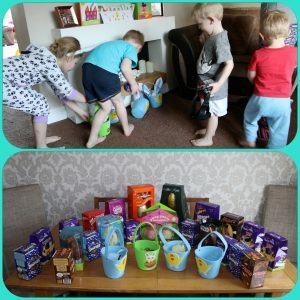 On the Sunday we woke up and the easter bunny had been so the tiddlies did an egg hunt. Seth wasn’t interested at all he just didn’t get that he was meant to be finding eggs [YouTube Video Here]. In the afternoon we had all of my family round as it was my sisters birthday. In the morning I had attempted to make a cake. 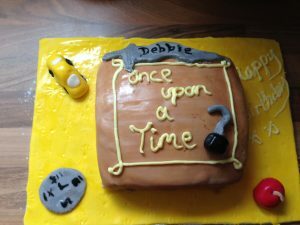 She loves the tv show Once Upon A Time so I attempted to theme it on that. In my own defence, I did make the cake in an hour and a half. It normally takes days to make a cake (I have made a few good ones). We had a lovely afternoon playing games eating food and catching up as we don’t all get together that often which is a shame. On Monday we spent most of the day downloading old video footage (from 2007/2008) from our old DV camera which we had forgotten about. We also cooked a roast dinner as we hadn’t had one over Easter and my Dad came up to eat with us. On Tuesday Adam sadly had to go back to work boo. 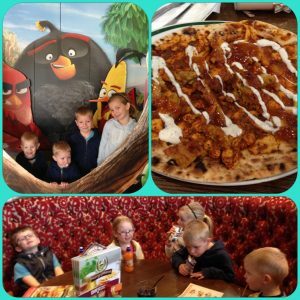 Me and the tiddlies went to the cinema with some friends to watch Zootropolis which was brilliant. I didn’t really have high hopes but we all loved it and Grace has declared she wants all the Tsum Tsum’s so we will be going shopping at some point for them. We also went for lovely lunch at a local pub and I had a Titan Naan with Chicken Tikka. It is amazing but way way to big for one person to eat but I gave it a really good go. Wednesday was a day spent with my lovely friend Sheryl and her beautiful little girls. We are so lucky as our children all get on really well so we are able to leave them to play while we drink coffee and have a good catch up. This is our break so far. We will have a few days in doing nothing as the weather is really bad. We also have a few more meet ups with friends and family and a soft play day. We may also go the Sea Life Centre, but will see how we all feel. Hope that your Easter holidays are going well without to many tantrums and melt downs and you are all enjoying some lovely family time together.